Tabs are great for browsing, but it does not take long before we have so many tabs open it’s hard to remember what each tab has. With Toby, a plugin for Chrome and Firefox, you’ll be able to organize those tabs and find that specific website quickly in seconds. Toby allows you to create tab lists as well as drag and drop tabs. Do you go to particular websites at work? Use Toby to create a tab list called ‘Work’ and drag all your work-related tabs there. You can also do the same for game-related tabs, for news, social media and so on. Do you visit the same websites over and over? Do you want those same tabs open the next time you turn on your computer? No problem, simply click ‘Save Session’ when you’re done and Toby saves the tabs. When you open your computer the tabs show up just as you left them. If you use Chrome you’ll see the tabs show up on the right so everything is easily accessible. Toby also makes it easy to rename those tabs. If that is not enough, the plugin has a search bar. If you can’t recall which tab list has the content you’re looking for, just type some associated words and you should be able to find it. Tabs provide you with a convenient way to browse, but sometimes it just gets too crowded. 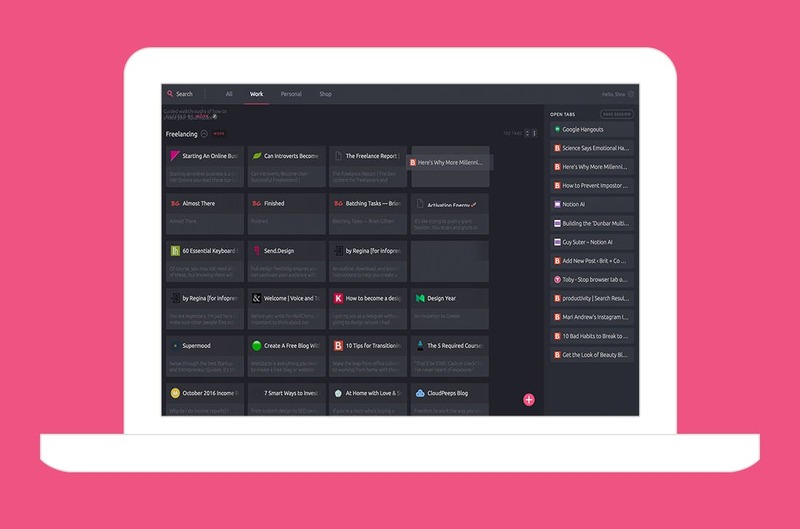 With Toby you’ll have an easier time managing those tabs and keeping track of all sites. Just a useful tool, period.